It is well-known that the class of sets that can be computed by polynomial size circuits is equal to the class of sets that are polynomial time reducible to a sparse set. It is widely believed, but unfortunately up to now unproven, that there are sets in (Formula presented. ), or even in (Formula presented.) that are not computable by polynomial size circuits and hence are not reducible to a sparse set. 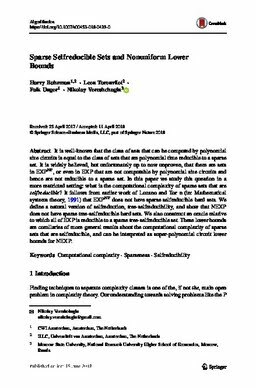 In this paper we study this question in a more restricted setting: what is the computational complexity of sparse sets that are selfreducible? It follows from earlier work of Lozano and Torán (in: Mathematical systems theory, 1991) that (Formula presented.) does not have sparse selfreducible hard sets. We define a natural version of selfreduction, tree-selfreducibility, and show that (Formula presented.) does not have sparse tree-selfreducible hard sets. We also construct an oracle relative to which all of (Formula presented.) is reducible to a sparse tree-selfreducible set. These lower bounds are corollaries of more general results about the computational complexity of sparse sets that are selfreducible, and can be interpreted as super-polynomial circuit lower bounds for (Formula presented. ).